Would you like to strike it rich through the purchase of land use rights? Consider bidding on the next oil and gas auction by the Brazilian government. Two of the most popular offerings by Brazil are described below. Brazil enacted Law No. 9.478 (“Petroleum Law”) in 1997 to establish Concession Agreements, the contracts for the extraction of oil from sedimentary basins. Under the Concession Agreement, a bidder would agree to undertake the risk of exploration in exchange for the exclusive right for the use of a piece of land. The government created the National Petroleum Agency (“ANP”) specifically to supervise the bidding process for oil Concession Agreements. The Petroleum Law has three major requirements for foreigners interested in extracting oil from Brazil. First, the foreigner must incorporate and maintain headquarters in the country. Second, the bidder must pay the ANP a signing bonus, royalties, and an occupation fee. The signing bonus is established in the notice to bid and is due at the Concession Agreement’s execution. Royalties vary between 5 and 10%, depending on geological risks and production expectations. The occupation fee is required yearly and based on per square kilometer of land. Third, foreigners must agree to use a minimum percentage of goods and services from Brazilian suppliers. Each foreigner must identify in its bid the local content percentage intended during the exploration and development phases. Since Brazil discovered a potentially lucrative new source of oil in the country’s pre-salt regions, it enacted two new laws to manage those types of oil extractions. Law No. 12.304 created the agency, Pre-Sal Petroleo S.A. (“Pre-Sal”), to administer the new Production Sharing Agreements (“PSA”). Article 10 of Law No. 12.351 mandates a joint venture between the government controlled oil corporation, Petrobras, and foreigners on all auctioned pre-salt blocks. The eleventh round of bidding in October 2013 was the first time Brazil offered the new PSAs. Foreigners must bear all the risks for developing the new area, which is estimated to cost over 175 billion reais or $82 billion US over the 35-year terms of the PSAs. If oil is discovered in a pre-salt block, the development and production expenses will be reimbursed from a percentage of oil sales. The remaining profit will be shared between Pre-Sal and the foreigner. Unlike the Concession Agreement, Pre-Sal only requires a signature bonus to be paid after signing the PSA and royalties, both of which cannot be reimbursed by oil revenue. Like the Concession Agreement, there are also minimum local content requirements for the pre-salt block bidding. Because of the onerous requirements by Pre-Sal, there were few bids for the pre-salt regions compared to the offshore sedimentary basins’ 71 bidders. Eleven foreigners registered but only one consortium bid. The bidding consortium consisted of the sharing of equity stakes by Royal Dutch Shell (20%), France’s Total S.A. (20%), China National Petroleum Corporation (10%), China National Offshore Oil Corporation (10%), and the remainder to Petrobras as required by law. Since oil sales from the pre-salt region will probably not be available until 2021, most foreigners are probably waiting to see if anything is discovered by the consortium. Unfortunately, no U.S. entities made bids in the May 2013 sedimentary basins round due to accusations of the United States spying on Petrobras. The Brazilian government owns a large share of equity (48.89%) in Petrobras. 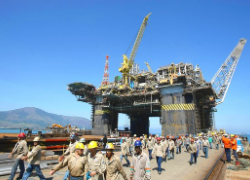 Brazil uses Petrobras to lower gas prices for the country as well as to promote economic growth in remote regions through the building of refineries. In essence, the Snowden leaks made it seem as though the United States was spying on Brazil through Petrobras.